Being a rock climber, you know that your shoes are the connection between yourself and the rock face. The best climbing shoes can make all the difference when attempting to master your ultimate goal. You can be climbing indoors, outdoors, bouldering, edging, smearing or jamming – whatever you do, your shoes are what help keep you glued to the wall, and moving steadily upwards. Climbing styles will differ, and your shoes will reflect those differences. However, no matter if you have a neutral, moderate or aggressive climbing experience level; your shoes are the most important aspect of your climbing kit. We are going to give you a rundown of what we consider the top climbing shoe on the market. This is based on reading extensive reviews from users and critics. How Should Rock-climbing Shoes Feel? View the Best Shoes for Climbing, Below. What size Rock Climbing Shoes do I Need? Do Rock Climbing Shoes Stretch? 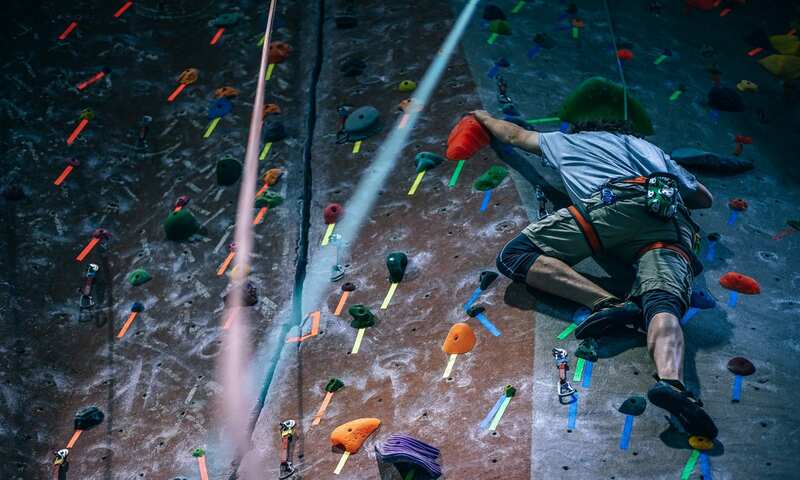 Climbing is a great way to not only get fit, but to also give you a shot of adrenaline. It is great fun for the whole family too. 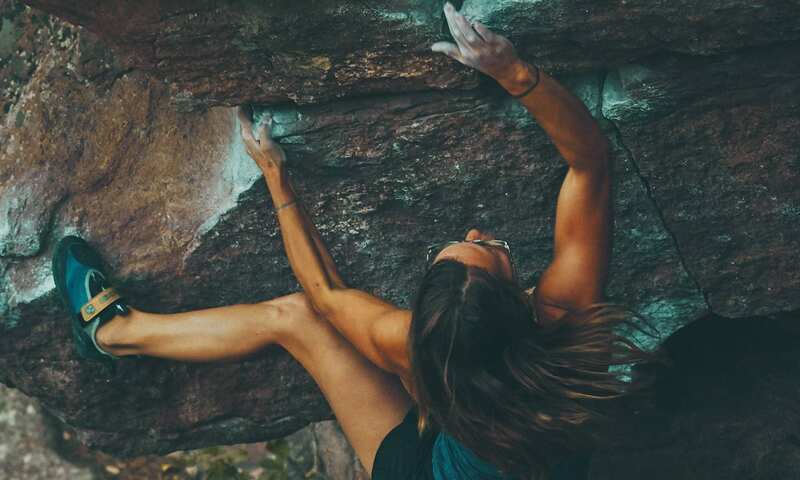 Yes it can be dangerous at times, and there are a few aggressive climbing advocates out there that can be considered daredevils, however, there are a lot of people who take on the sport to add a touch of fun to their workout regime. Thinking about CrossFit for working out? Check out the top shoes for CrossFit. We hope to help you with our climbing gear guide! The first step when considering climbing, is to choose the discipline or type of climbing you want to do. You can choose from indoor, outdoor, or bouldering, and each of these types of climbing require a different kind of kit and approach. Most will start their journey with indoor climbing, bouldering or top-rope climbing in the great outdoors. No matter where you start or how far you go, you will need the best kit. This includes the best shoes to enable you to get the grip and support you need. These shoes will help to keep you on the rock, and not dangling from your climbing ropes – resulting in having to be belayed down, without even reaching the top! The look and feel of your shoe will differ, depending on the type of climbing you are going to be doing. Beginners will look at a little looser fitting shoe that is comfortable and supportive, but the more aggressive experienced climber of higher skill levels will go for the tighter shoe. This allows them to perform spectacular feats on the rock face. 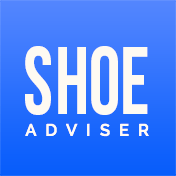 There are a number of aspects to your shoe that will determine how it feels on your foot, including the “last” or style of the shoe, different closures, soles, outsoles, material used and more will determine not only how the shoe will feel on your foot but also what it will enable you to achieve on the rock face or the climbing wall. 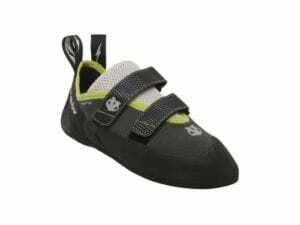 Climbing shoe last is simply the manner in which the climbing shoe is built. The “last” will not only determine the height and volume of the shoe but also the width and dimensions of the heel and toe area. Most of your rock shoes will be slip-lasted but some will be board-lasted. The “last” determines the shape of the shoe and this will affect the manner in which the shoe will support the climber and the kind of fit the shoe offers. There are three shoe types of “last” shapes. Board lasted shoes are shoes that are a lot stiffer in design with the material between your foot and the sole of the shoe is stiff. They are engineered for beginner climbers or for advanced climbers who are taking on long outdoor routes. They support your feet a lot more than you slip lasted shoes and help to prevent fatigue. Climbing steep or overhanging rock is difficult with these board lasted shoes as they are not very flexible. Slip lasted shoes are perfect for smearing or climbing on smooth rocks. They are also great for climbing on training walls, overhangs, and steep trad climbs. They are climbing shoes that are designed for advanced climbers and the shoes perform hook and grab holds well. This shoe, however, can become very uncomfortable when it comes to longer routes or when climbing carrying a pack or having to take on crack climbing. Unlined leather shoes will tend to stretch, if you are going to select an unlined leather shoe then you need to get the fit just right. To be sure you get the right size, you need to ensure that the fit of the shoe when you purchase it is very tight, your toes should be pushing up against the leather. Lined on the other hand will stretch a lot less. Some brands only line the toes of their shoes to prevent stretching where it is most likely to occur in the shoe. Most of your high-performance shoes will be made from synthetic material, they do not stretch and tend to have a very good fit that will remain the same throughout. Some of the synthetic shoes contain perforations which allow the foot to be able to breathe, they also often contain qualities that allow them to wick away water. The synthetic shoe will soften after a lot of use. The thickness of the outsole will definitely affect not only the performance of the shoe but also the feel of the shoe. Most thickly soled climbing shoes will range between 4 and 5.5mm. They do not give you the same kind of sensitivity you will get with a thinner sole, however, they do offer great durability and are perfect for edging. Beginners will generally choose a thicker soled shoe which helps to prevent fatigue as well as providing better support for your foot. Thinner soles will range between 3 and 4mm and are great for smearing when you are ready to take on more difficult rock climbs you will move on to thinner soled shoes. There are three shoe types: lace-up, slip-on and strap closure shoes. Lace-up shoes are the most versatile of all the climbing shoes; they are great as you can loosen the laces if your feet swell or if you need to walk along the routes. Strap closures, on the other hand, are hook-and-loop as they are sometimes known, are perfect for gym climbing or bouldering and are easy to put on and take off. Finally, the slip-on style or slipper offer an elastic closure and are the shoes that offer the most sensitivity of any of the climbing shoes. They are perfect for training and they work well when crack climbing. Gender to a large extent does not make a huge difference in selection of climbing shoes. Men’s shoes do tend to be a little wider in both the heel and forefoot and in a man’s shoe the upper might be a little higher. Most manufacturers will have shoes that are great for both men and women. With small distinctions in the sizing, and whether you are a woman or a man it is important to choose a shoe that fits perfectly and molds to your foot keeping it snug and secure during your climbing. Born in 1928 the La Sportiva brand has always crafted superb outdoor climbing gear from leather hand-crafted boots for farmers and lumber-jacks where it got its start to providing shoes for those that want to take on the challenges and dangers of rock climbing such as Anna Vollenwyder who is one of their brand ambassadors. 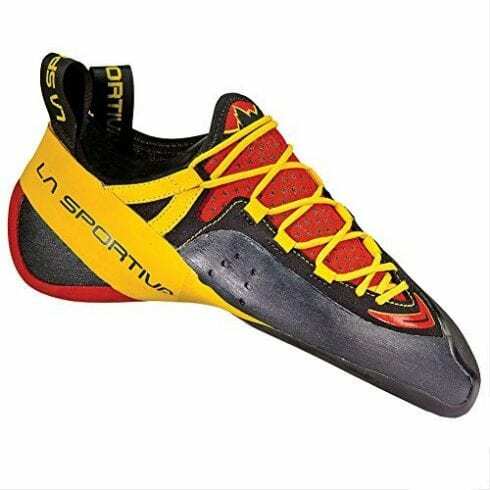 The constructions of the la sportiva tarantulas are from 1.8mm LaspoFlex at the midsole and 5mm FriXion RS at the sole and these two aspects of the construction make them extremely stable and durable. They are designed to fit tight without being painful and will not put any added pressure on the pressure points on your feet while climbing. The lacing system on the shoe is designed to be efficient with a quick-pull lacing climbing harness, engineered to wrap your foot snugly for a great fit. The leather upper is unlined making is incredibly soft with a lined tongue which will help to control moisture and also ensures that the shoe is breathable with a synthetic leather overlay for maximum support. The edging on the shoe is highly advanced and this allows intermediate climbers to be able to smear, hook and edge. The sole of the shoe offers an aggressive rubber heel rand, and the soles are FriXion RS rubber soles. The RN45 build is asymmetric and will help you to get the best purchase even on micro edges. 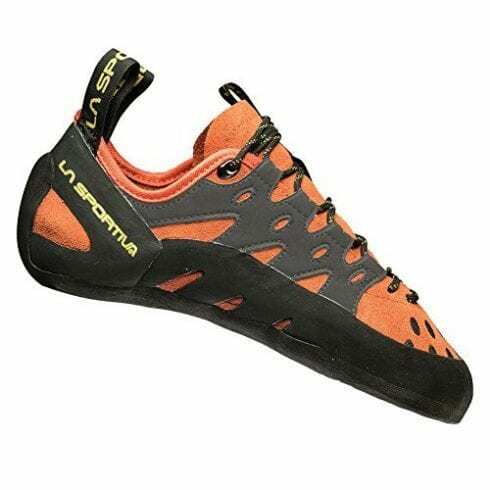 With this climbing shoe, La Sportiva has opted to design a shoe that can not only be used for both indoor and outdoor climbing but it is also not gender specific. These are one of their high-performance climbing shoes that are designed to help you reach new heights no matter what climb you are looking to take on. La Sportiva have designed a shoe in the La Sportiva Genius that will help you to excel on the rock face and although they may be more expensive than some of the other shoes on this list, they will be well worth the money spent considering what they offer in durability, stability, comfort, support, and value for money. With slip lasted construction it is strong and can be used for indoor gyms, rock faces, bouldering and for tackling overhangs. This is a shoe that is designed for the advanced climber with a downturned shape and large surface area, which allows for optimal contact with holds. Engineered for on-the-fly adjustments, the quick-pull lacing system offers the best regulation of inner volumes and will wrap your foot snugly in the shoe. The materials on the shoe include Vibram XS Grip2 sole and unlined suede leather upper, which provide the balance that you need. The Laspoflex midsoles along with the patented P3 technology offers you the most powerful support even when you are not wearing them extremely tight. The no-edge technology makes it very responsive to allow you the greatest sensitivity and gives you the ability to get great push and ability to use even the tiniest of holds. These high-performance climbing shoes are designed with a grippy heel and sticky sole you can tackle any of the most difficult climbs with confidence. Built to accommodate both the male and female climber who wants to take their climbing to the next level, taking more challenging climbs. Durable, supportive and comfortable, they are sure to be a hit in the climbing gym or on the rock face alike. Evolv is a footwear company that specializes in producing some of the best high-performance allaround climbing shoe footwear. They are a US-based company, started in 2003 it has evolved into one of the top rock climbing shoe companies, not only in the US but the world. 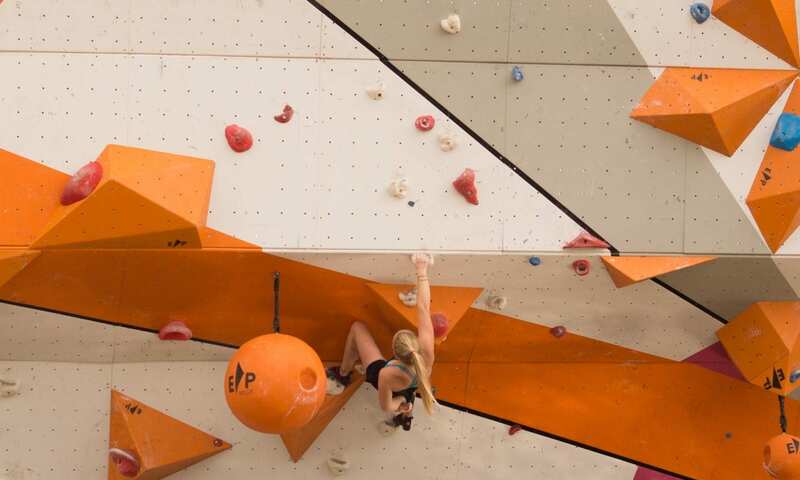 Some of the top climbers who sport the Evolv brand are Ashima Shiraishi, Liza Rands, and Alex Johnson. The Men's Evolv Defy climbing shoe offers a number of features to enable the beginner or intermediate climber who needs the grip and sensitivity to allow them to tackle both indoor and outdoor climbing courses as well as bouldering with the confidence, offering the breathability, stability, support and comfort that you need to get your climbing adventure started or to take it to the next level, without costing you a fortune. As an alternative, you can also check out the evolv addict, and evolvs shaman shoes. The build of the shoe is asymmetrical with a synthetic Synthratek upper that is perforated for great breathability. The lining of the shoe is constructed from nylon which is both plush and comfortable with an MX-P 1mm half-length midsole that offers great sensitivity. The climbing shoe offers a soft and secure fit and has been treated with an anti-microbial mesh material, this material will help to eliminate bacteria in the shoe and this will eliminate any odors from frequent use. The traction on the shoe is exceptional with a VTR rand or thick front toe area, and a 4.2mm TRAX rubber sole that offers high friction to enable you to get the most grip out of your climbing shoe. The perfect shoe for the beginner or intermediate climber, not only will it keep your feet secure and comfortable while taking on the rock face, it will also keep your feet fresh and ready for anything. This is a well-priced climbing shoe with many superb features on offer. With La Sportiva being such a phenomenal climbing shoe manufacturer it should not come as a surprise that they find themselves on our list again. 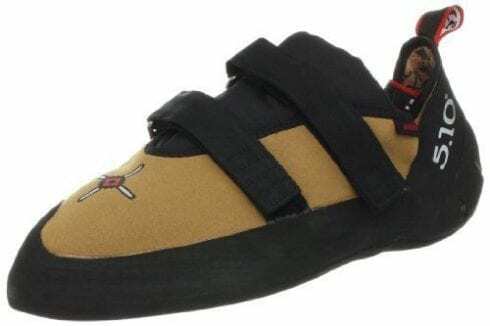 This is another of their gender-specific shoes being designed to give the male rock climber all the features they need to take their climbing to the next level. Durable, supportive and offers great stability and breathability - TC Pros are one of La Sportivas genius offerings. The unlined sole with PU foam and constructed from Sentex with an Airmesh tongue. Weighing in at a mere 8.71oz with a midsole constructed from 1.1mm LaspoFlex P3. The mid-height design of the shoe along with a thin ankle and padded protection above the toe for crack climbing. A leather upper with Vibram rubber rands this is a highly breathable and durable climbing shoe that is both comfortable and with a fit that is snug and soft, it is great for crack climbing, face climbing and climbing big walls. The P3 platform design is a flat fit for optimal sensitivity and great comfort. The sides of the shoes are perforated to allow for great airflow keeping your feet cool and dry, the tongue of the shoe is also ventilated. The grip on the shoe gives you the best grip when climbing faces that have sharp edges. An excellent climbing shoe for beginner and intermediate climber. If you have taken that next step and moved on from beginner status to intermediary status in the climbing world then the La Sportiva Men's TC Pro is the shoe you are looking for. It is designed for both indoor and outdoor climbing and is sure to give you the edge when tackling the more difficult routes. 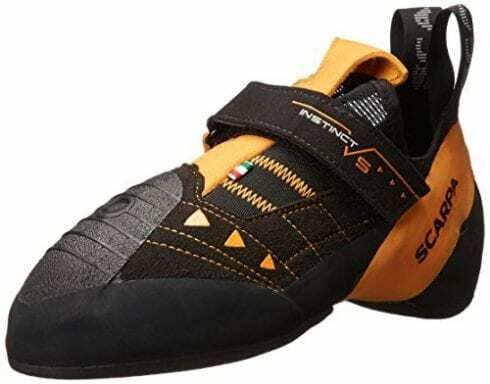 Scarpa design their shoes with the climber and their specific styles of climbing in mind. They cater for all types of climbers from the sport climber, to the big-wall climber and everything in between to give you the ability to take on whatever route you want to tackle knowing that your feet have the best protection, fit, support and stability, coupled with great toe power to enable you to push upwards, in the form of a great rock climbing shoe for men. A high-performance shoe that is perfect for intermediary and advanced climbers. No matter what you are looking for in an intermediary to advanced climbing shoe the Scarpa Instinct VS climbing shoe offers you the features you require to take your climbing journey to the next level. Excellent rock climbing shoes that offer a synthetic sole and a mid-length outsole construction. The Bi-Tension Active Randing is highly charged and will offer you the best toe power you can get in a climbing shoe. The forefoot is constructed from Vibram XS Edge which provides you with the best grip and excellent durability. The Vibram XS Grip2 allows for great heel hooking and the floating power strap will both enhance the fit of the shoe as well as the power you need to get up those difficult climbs. This shoe is soft and the slipper design with a single strap and the Vibram XS edge rubber will ensure that you do not have any deformation when you stand on edges or stand on micro-flakes. With great sensitivity, you will be sure to be able to follow overhanging routes and slabby boulder problems with a high-performance arc. You also get the Scarpa instinct lace for extra comfort. Intermediary and advanced climbers will find this shoe offers them the toe power to push upwards and is designed to offer the best performance no matter if you are bouldering or climbing the big-walls indoors or even when you are taking on the more difficult routes on outdoor rock faces. The Five Ten climbing shoe company, was the brainchild of Charles Cole who designed the first of the sticky rubber sneakers known as the Five Tennie to enable him to get better grip when climbing in Yosemite and Joshua Tree National Parks, for which he was quite famous for taking on some of the really difficult approaches and ascents. The company's name, Five Ten, speaks to Charles's love of climbing being based on the Yosemite Decimal System that is used to rate the difficulty of climbs. The Five Ten Anasazi is one of Five Ten's all-round climbing shoes designed for a variety of climbing activities. They are engineered for both indoor and outdoor climbing, so you can take on the big-wall or the steep rock face, and offer the kind of features that allow you to smear even on soft surfaces such as sandstone. This climbing shoe is designed to offer the intermediate moderate climber the kind of support, durability, flexibility, breathability, and comfort that is required to take on some of the more tricky climbs, advancing from their beginner status to the next level in climbing. Well-constructed and offering a Velcro strap which will ensure that it stays on your feet at all times and keep your feet secure and snug during each and every climb. The toe box is asymmetrical and will protect the foot along with a high heel tension for great support. The upper is made from a synthetic upper, which is lined, and will not stretch even when working hard. You can get the five ten anasazi pink today! The 4.2mm C4 rubber outsole is strong and durable and gives you enough grip to be able to tackle difficult and tricky climbs. A climbing shoe that is perfect for both indoor and outdoor climbing. It will smear on either porous or soft surface and is a very popular shoe for all climbers. The features ensure that the climber gets the best support, comfort and sticky sole as possible to take on some of the more difficult routes. Here we have another great offering from Five Ten . 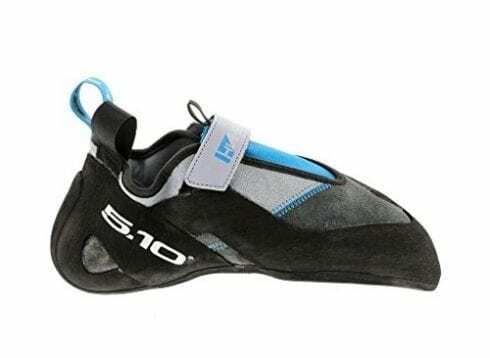 Five Ten climbing shoes are well known in the industry, they are not only popular but also very well made, and offer the perfect, well-designed climbing shoe. The Men's Five Ten Hiangle are soft, smooth and supportive to give you the most comfortable fit, along with a really aggressive downturn sole to enable you to take on the high rated routes and are perfect for the advanced climber to take their climbing to the next level, be in on the big-walls at the indoor climbing gyms, to the difficult and tricky outdoor routes where it is just you and the rock. These shoes have downturned toes that let your feet grip and pull onto holds. Primarily designed for overhanging rock and steep plastic, this style of shoe has the most aggressive heel tension and an asymmetric shape for added toe power and precision. The aggressive downturn profile of the five ten hiangle is designed to allow you to edge on vertical walls, with a stiffer midsole slipper that has a single strap which is situated on the arch to lock your foot into place. Downturned toes help to pull you into holds and give your feet the grip you need, and the asymmetric shape with extremely aggressive heel tension give you the best toe power and perfect precision. The unlined leather upper has a half-size stretch. The material is smooth and soft giving you a very comfortable fit. Comes with a Stealth C4 rubber outsole that is designed to be able to cope with the most difficult of climbing routes. They are grippy and sticky and will get you through everything from overhangs to sheer rock faces, being able to smear, jam and edge comfortably with these soles. The unlined leather upper is odor resistant and will not stretch more than a half size even after a lot of wear. Perfect for both indoor and outdoor climbing this is a great, supportive and comfortable climbing shoe for intermediate to advanced climbers. Butora is another company that specializes in manufacturing climbing shoes for those who love the adventure and wants to take on the challenge of the sheer rock face. The founder Nam Hee Do is an avid climber himself and with a number of years in the industry behind him, he introduced his first climbing shoe in 2014, from where the company has gone from strength to strength. The Acro wide fit climbing shoe is engineered to accommodate those climbers with wide feet and those that want to tackle the steeper sport climbing routes or for those who love to boulder. The rubber is soft with a toe patch that is high friction to enable you to toe hook and the heel cup with sticky rubber allows for heel hooking. The shoe is designed to offer high-performance toe power and enable you to edge perfectly. 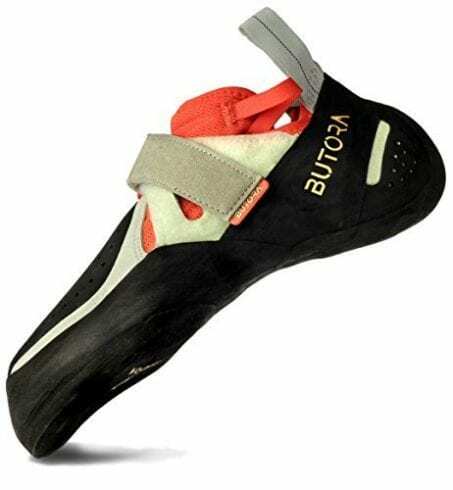 The Butora triple fork hook-and-loop closure enhances the structural integrity of the shoe and ensures that your foot remains secure and retains the sensitivity needed for the most delicate of moves on the rock face. It is an extremely flexible and dynamic climbing shoe that allows for a wide range of movement. The combination of soft synthetic and natural leather in the upper construction allows for even greater performance and a surprisingly comfortable fit. The large sticky rubber toe patch allows for secure toe hooking in even the most technical situations. The high-tensioned heel rand gives you the power in the toe to enable you to get the grip you need for the best edging. Designed to fit all shapes and sizes of feet with a floating closure strap this is a shoe that will accommodate people with wide feet as well. The sock-like upper of the shoe and a turndown Boostic is stretchable and fits the foot snugly and offer a precise fit. This is an advanced, aggressive shoe that is designed to allow you to take up the challenge of steep verticals or overhangs. Clinging to fissures and using the minutest of footholds will see you reach the summit of even the most challenging of climbs. As an alternative, you can check out the Butora endeavor shoe. With Scarpa being one of the most recognized climbing shoes in the world, it is no surprise that they have more than one of their offerings on our top pick of climbing shoes. The Boostic offers the MRRB Technology that allows you to be able to take on steep verticals with a superb range of response and balance. These shoes it true to size and will accommodate all shapes of feet offering both narrow feet and wide feet options. The speed lace system allows for you to put on and remove the shoe quickly and easily. It is not only durable but also extremely breathable keeping your feet cool and dry. The lining of the shoe includes TXT treatment, the narrow last and mid-stiff midsole gives you the sensitivity you need to take on steep terrain and will be equal to the task when it comes to vertical edging with only tiny holds. With a one hundred percent microfiber upper which is breathable and comfortable, conforming to your foot perfectly. MRRB technology adds to the comfort, flexibility, and balance in the shoe. The fit is comfortable and soft, with a microfiber upper that is lightweight as well as breathable and molds to your foot nicely. If you are planning on bouldering you can consider buying a half size down from your standard shoe fit. Otherwise, it will fit true to size for standard shoes. The Vibram XS Grip is 3.55mm offering not only a sticky grip but also optimum friction and durability. One of the most accurate climbing shoes for beginners or intermediate climbers they are perfect for both indoor and outdoor climbing and can take on even the steep verticals and overhangs. The Scarpa Boostic is engineered to give the beginner and intermediate climber the edge when it comes to mastering different techniques and taking their climbing to the next level. Technical climbers and those with narrow feet will really enjoy the Tenaya Tarifa shoe. The engineering on this climbing shoe allows you to edge with ease, even on a razor crimp, smearing on a low-angle is no problem and the tiny nubs on the roof are no problem when tackling the overhangs. Offering a design that allows you to take on routes that require very demanding foot placements and puts the power in your toes to push through, as well as being extremely flexible for marginal smears. A high-performance shoe that offers great comfort and skill levels and a medium-stiff sole with a supportive heel cup and forefoot that is also extremely flexible in the arch and midsole of the foot. The interior shock gives you a snug feeling on the shoe and the padding in the sock make for extreme comfort. With the lacing system, you can tighten or loosen to fit whatever type of climbing you will be doing. The sticky soles and Vibram XS Grip rubber, which surrounds the shoe and extends up the sides are perfect for rocks, limestone or even polished granite. The extra-large patch on the toe is great for hooks. The uppers are microfiber, which has Perforations that increases breathability while the tubular-shaped bellows tongue provides a glove-like fit and superb control. The design and construction of the shoe will definitely give you one of the best fits, especially for narrow footed people. This fit is also flexible - giving you a snug fit that gives you a sock-like fit molding to your foot and giving you ultimate control. They do tend to run a little large so consider sizing one size down from your normal size when selecting your shoe. These shoes are engineered for both outdoor and indoor climbing. They offer a balance of stiffness and flexibility and also offer the best grip and comfort. Single-pitch, multi-pitched climbing along with bouldering are no problem with these great climbing shoes. Perfectly designed for the aggressive climber who tackles the higher rated routes. Sizing in a climbing shoe is really important. You should not have any gaps between your toes and the inside of the shoe, this is because you need them to remain rigid when gripping on a foothold. The shoe should keep your heel snug and are not painful when wearing them. There is no hard and fast rule when it comes to selecting your climbing shoes. There are some people that will prefer specific brands and styles of shoes. This is because the best shoe for you will be based on your own climbing style, type of climbs you like to do and how long you will be climbing for. Some shoes are a little stickier than the other and the one you need will depend on the climb you are doing, if you are tackling vertical climbs, overhangs, bouldering or straightforward indoor climbs will determine which shoe is perfect for you. Yes, most definitely if you are going to do rock climbing you need the specialized rock climbing shoes which will provide the traction, friction, and grip to hold onto the rock face with your feet. These shoes provide you with the stability your feet need as well as stopping them from sliding around in the shoe. Edging, smearing and bouldering cannot be done without specialized climbing shoes. The climbing shoes with leather uppers will stretch; the unlined uppers will stretch up to 1 size and the unlined up to a half size. Synthetic shoes will have minimal stretch and will not change much over time. When considering which climbing shoe you need, consider what type of climbing you will be doing and what is the most important feature for your needs, be it comfort, aggressiveness or style of closure. Rock climbing is a superb way of getting in your exercise in a fun and adrenaline-packed way. It is not only exciting but can be extremely challenging and when you are taking it to the ultimate level (e.g. free solo climbing), dangerous. For the study on the motivations of rock climbers click here. Having the right equipment, including a climbing harness, climbing ropes and shoes make the difference between reaching the summit and, falling short of your goals. A climbing shoe that offers the grip, support, stability, and comfort you need will ensure that you reach your goals whether you are a beginner just starting your journey or an advanced veteran climber who wants to take on the challenge of the more highly rated routes. Climbing gear has had an interesting history in terms of how the gear has had to evolve, and the increasing standards climbing gear needs to adhere to. When selecting the right shoe for you, ensure you go towards the end of the day, and take any wraps or straps that you usually wear with you to ensure you get the best fit and the right size shoe. Climbing gear needs to be reliable and slip resistant. When selecting your climbing shoe to ensure you shop in the afternoon as your feet may swell during the day, fit your shoe without socks and be flexible about sizing. Although everybody has a different way of bending their feet to get a shoe on, if it does not slip on easily, then it is probably too tight a fit for you. We hope you enjoyed our article on "The 10 Best Climbing Shoes", if so, please share and rate it.